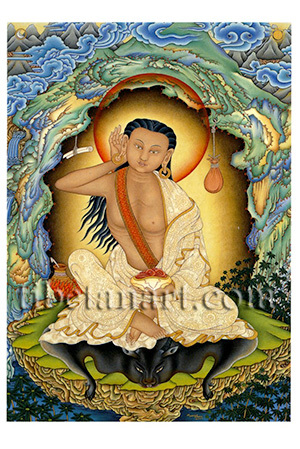 Milarepa (1040-1123), the 'cotton-clad' yogin, is Tibet's most famous and beloved poet-saint. His intense perseverance and devotion under the arduous guidance of his Tibetan guru, Marpa Lotsawa, his spontaneous songs of realization and poignant life-story, are a constant source of inspiration for all spiritual aspirants. He is shown here sitting upon a black antelope skin in his meditation cave on the eastern side of Mt Kailash in western Tibet. He wears the single white cotton robe of a Tibetan yogin or repa, symbolizing his attainment of the yogic practice of tummo or 'inner heat'. His long hair hangs freely down his back, and he wears a red meditation belt across his right shoulder. With his right hand he cups his ear in the gesture of singing, while with his left hand resting upon his lap in the gesture of meditation he holds a skull-cup full of nectar. Hanging from the roof of his cave is a small bundle of provisions and a scroll of special instructions that Marpa gave him to help overcome a future period of doubt and difficulty. In the background of his cave is a clay pot full of boiled nettle soup, and in the bottom corners are the nettles that still grow in front his cave, which for many years served as Milarepa's main sustenance.